Make Memories This Summer – Bring Your Child to the Rink! School is almost out which means your kids will likely be home all summer long. While this can be super fun, it may become rather boring after a few days. Fortunately, there are many ways you can keep them entertained and strengthen your family ties at the same time! Colorado is beautiful in the summer, and you should take advantage of the outdoors with the family! When you choose to camp, you are unplugging from the many demands of life. You can do various camping activities such as making a campfire, fishing, telling stories, and identifying different trees and animals. If you don’t want to travel far, camp out in your backyard! Your kids will love it and we bet you will, too. Kids of all ages love games. So, what if you hosted a game night at your own home? You can bring out all the board game favorites or set up a charade space for the kids to enjoy. When kids play and have fun, it’s actually helping their mental, emotional, and social health. If you do this one night a week for the entire summer, you could even keep track of who’s “in the lead” and determine a winner at the end of summer! 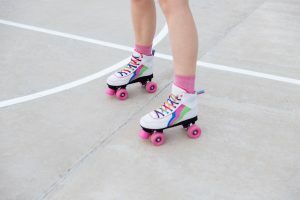 The team at Rollerland Skate Center loves all of these ideas … but skating with the whole family is definitely our favorite. Check out our summer hours, call up all of your family members, and head to the skating rink! We know everyone will love this awesome activity.